Lena’s mission is to empower active, caring, modern women to choose a better way of living for the planet. They are very conscious of their sustainability. By choosing the Lena cup, you are not only improving the environment by cutting down on tampon and pad use, but also choosing a sustainably produced product and packaging. The Lena is both attractive and very practical. It comes in one cute pink color and is made of medical grade silicone. It was engineered to be comfortable, with a smooth bell shape and gentle ridges along the base and stem to aid in removal. The Lena cup does not have any features that make it particularly difficult or easy to insert. The Lena cup has ridges which should aid in gripping the cup for removal and airholes which should facilitate breaking the suction which will also aid in easy removal. The Lena comes in two sizes. The small size holds 25ml of liquid and is suitable for anyone with a normal flow or anyone with a low cervix. The large cup is better if you have a heavy flow. They suggest that most women can wear either cup comfortably according to their preference. The Lena cup has ridges and airholes which are necessary for insertion and removal but no superfluous engravings. It should be relaively easy to clean the Lena cup. 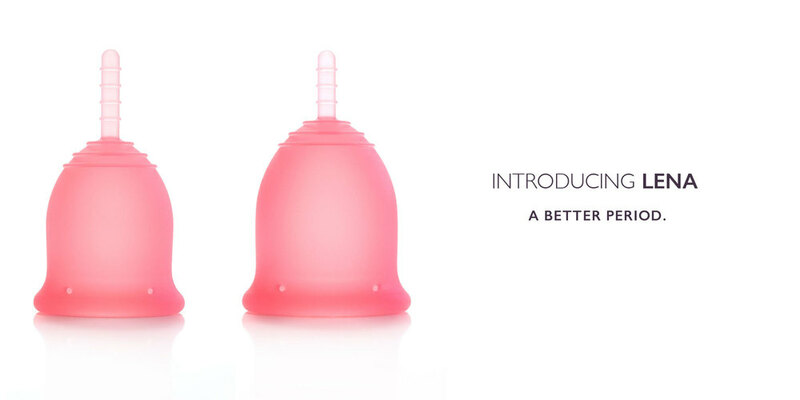 The Lena cup is one of the few menstrual cups registered with the FDA.